The logistics industry cluster is one of the largest in South Carolina according to a study released by the South Carolina Council on Competitiveness (Council). Authored by Dr. Joseph Von Nessen, the study finds that there are more than 600 logistics companies operating in the state, from transportation, to air freight providers, to warehouse and distribution centers. S.C. Commerce Secretary, Bobby Hitt, knows that businesses locate to areas where they are able to be successful and thrive. The strength of South Carolina’s logistics industry is shown in part by export sales. For the seventh consecutive year, South Carolina posted a record for total export sales of $31.3 billion—a $400 million increase over last year. South Carolina’s top export commodities were vehicles, aircraft, machinery, rubber and electrical machinery. And, the state’s top export markets were China, Germany, Canada, United Kingdom and Mexico. The Council’s study was paid for in part by a grant from the Economic Development Administration. 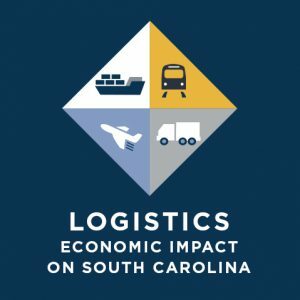 The Council and the S.C. Department of Commerce received the federal grant last year to launch the logistics industry initiative, SC Logistics. The initiative is organized by the Council and operates through an Executive Forum which consists of business leaders from the private sector and critically relevant state agencies such as the Department of Commerce, Department of Transportation and the Ports Authority.